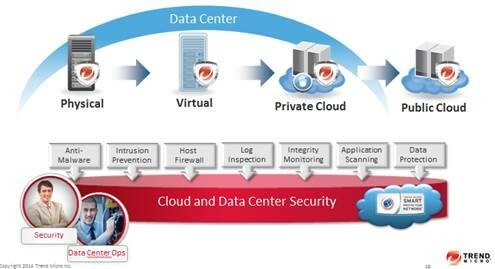 As a 26 year security leader and innovator, Trend Micro’s Deep Security Solution is architected in partnership with VMware and various Cloud Service Providers and delivers a complete security platform for physical, virtual and cloud environments for businesses of all sizes. The Deep Security software promotes a proactive and comprehensive security posture without compromising performance. Deep Security is highly automated, highly scalable and allows for simple and easy management from a single console. Our integration with ESX/NSX and various Cloud providers (AWS, Azure, etc.) is second to none. Deep Security’s agentless support for both file (anti-malware, file integrity monitoring) and network security controls (intrusion detection and prevention) give us a unique edge over other security companies in the market. The Deep Security Enterprise suite includes the following modules: Anti-Malware – Intrusion Prevention – Host Firewall – Log Inspection – Integrity Monitoring – Application Scanning – Data Protection. For more information or a demo, feel free to contact Brian Hoover @ brian_hoover@trendmicro.com. Christian Fontaine served as CISO at the University of Guelph at Humber in Canada. He has also served as a private security consultant for the Canadian police agencies. Chris currently resides in Tampa, FL and has been employed at Trend Micro for over 8 years. Chris currently serves as a Sr. Security Engineer for the Southeast region and works with Fortune 500 companies in North America during the pre and post sales process to understand and deploy Trend Micro solutions. Chris also sits on several strategic security committees at Trend Micro that evaluate and architect solutions that meet current demands for virtual and cloud environments. Chris has been involved in digital investigations up to the international level, specifically in the areas of steganography and cryptography use in cyberterrorism activities. Chris has a strong conviction that security concerns are best addressed by well-prepared and security-focused individuals. Information security, like everything else, is a human enterprise and is influenced by factors that impact the individual. It is well known and documented that the greatest information security danger to any organization is not any individual process, technology, or equipment; it is the people who work within the 'system' that can mask the inherent danger. Chris enjoys being involved in security training, education, motivation, and awareness activities. He is especially interested in the psychology of security awareness and influence – The Science of Persuasion and Influence – and the tripartite model of Security ABCs (Affect, Behavior, Cognition).